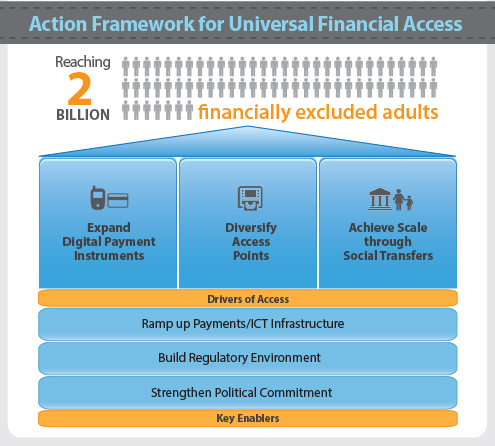 The World Bank Group (WBG) has identified country-level opportunities for opening up access to transaction accounts through the Universal Financial Access framework and data model (note). The UFA2020 initiative is focusing on 25 countries where 73% of all financially excluded people live: Bangladesh, Brazil, China, Colombia, Cote d'Ivoire, DRC, Egypt, Ethiopia, India, Indonesia, Kenya, Mexico, Morocco, Mozambique, Myanmar, Nigeria, Pakistan, Peru, Philippines, Rwanda, South Africa, Vietnam, Tanzania, Turkey, and Zambia. 1.3 billion adults by opening up the regulatory environment and market to reach financially active, unbanked adults who currently save, remit or pay bills in cash. 167 million adults by digitizing government (G2P) payments provided to unbanked adults and depositing them directly into transaction accounts. 802 million adults by developing and implementing national financial inclusion strategies (NFIS) to coordinate financial inclusion efforts and increase the number of banked adults over time. These opportunities are not exhaustive, and they overlap. Key enablers like financial capability, adequate consumer protection and/or financial infrastructure are needed to foster the full reach to the unbanked. * New Payment Aspects of Financial Inclusion (PAFI) guidance has been launched with an updated framework that provides guidance to regulators and policy makers. Country opportunities are calculated by segmenting unbanked financially active adults who can be reached through specific interventions. Interventions cannot always be added up simply to create the country opportunity, as the three interventions may overlap. However, WBG analysis discounts these overlaps for the Total Opportunity for each country, thereby the Total Opportunity may be less than the summation of the 3 interventions alone. The World Bank Group’s projected reach is based on engagement activities linked to project targets, constraints of unbanked adults and attribution of financial inclusion strategies. Actual reported reach is used to update projections as that data become available. Please note that the opportunities are calculated with 2020 in mind as the end year, taking into account population growth based on UN predictions, and therefore may exceed the current number of unbanked. All indicators are calculated using raw data from the Global Findex database unless otherwise noted.